In Simon Spurrier and Bilquis Evely’s THE DREAMING #1, we’re reunited with many of the colorful denizens of Neil Gaiman’s surreal kingdom of dreams. For SANDMAN fans worldwide, they’re likely to be welcome reunions, and yet, for my money, the most interesting character in this densely scripted first issue is by far the one we know the least about—Dora, the scrappy, not-entirely-welcome young woman with wings on her head. For all its weirdness and eccentricities, the Dreaming has always been a pretty orderly place. It’s ruled by a king, who has a full support staff, ensuring that even when Dream goes wandering—as he is wont to do—everything keeps running and going according to plan. It may not be a perfect system. Things can and do go wrong, but it’s a pretty tried-and-true way of running things and for many years, it’s largely worked. However, that seemed to grind to a halt last month with the release of THE SANDMAN UNIVERSE #1, which revealed that Daniel, the new Lord of Dream, had disappeared and in his absence, an ominous rift had been driven through the Dreaming. Poor Lucien, who is charged with overseeing everything in Daniel’s absence, is pretty lost about what it could mean, and as we learn in The Dreaming #1, also seems to be affected by it. Even worse, the rift isn’t just an empty crack in the substance that makes up this mysterious world—things are actually coming through it. Those things are odd, humanoid creatures that the people of the Dreaming call “blanks” due to their white, barren features and lack of will, mind or voice. Where the blanks are coming from is one of the issue’s big mysteries (and there are many more, as I said, this is a densely written comic). The blanks haven’t been clear on what they want, but regardless, they’re clearly a problem that poor Lucien doesn’t need on top of everything else. In short, after years of relatively smooth sailing, the Dreaming has hit its first real crisis of government. The rules have gone out the window. There’s a giant rift through the kingdom that has literally divided its people and there are malevolent forces just outside its borders looking for the first chance to invade. To those in charge, Dora likely seems like another problem to be solved. Another uncertainty with the potential to do real harm. There’s definitely some truth to that. One of the first things we see her do is stealing from peoples’ dreams. She follows that—in one of the comic’s best scenes—by shagging a demon. She yells at those in charge, refers to Daniel as a “spoiled brat,” downs a pursuing Matt. There’s little doubt that Dora could mean trouble. Yet, you can’t help but feel that there’s much more to her than that. Early on, we also discover that Dora’s taken one of the blanks as a companion, dressing him up and giving him a name. She’s also the recipient of a new gift left by an unknown admirer every morning before she wakes—gifts that seem to please her. We’ve also learned, those of us who read her intro in The Sandman Universe, that Dora seems to care considerably about the dreamers, especially ones who are suffering. While there is undeniably great anger in Dora there’s also a tenderness just beneath the surface. And that’s fascinating because also just beneath the surface, she’s a monster. We caught our best glimpse in The Sandman Universe, but you catch flashes of it here too. Dora has claws, teeth, great strength and unending hunger that drives just about everything she does. She can look frightening, and it’s likely this has also contributed to people’s uncertainty about her and her motivations. Yet, it’s also what makes her so fascinating. Dora isn’t a hero and she isn’t a villain. She possesses the capability to destroy and tear down, and she’s clearly not one for following rules. Yet, she also is capable of great empathy and warmth. She’s the only character (at least, so far) who seems to view the blanks as individuals, along with one of the few who considers the person on the other end of the millions of dreams that make their way through the Dreaming’s atmosphere. The fact that she’s both of these things isn’t original and it isn’t unique. We all have the capability to be monsters or angels. However, the behavior and the appearance aren’t so clearly aligned with Dora. 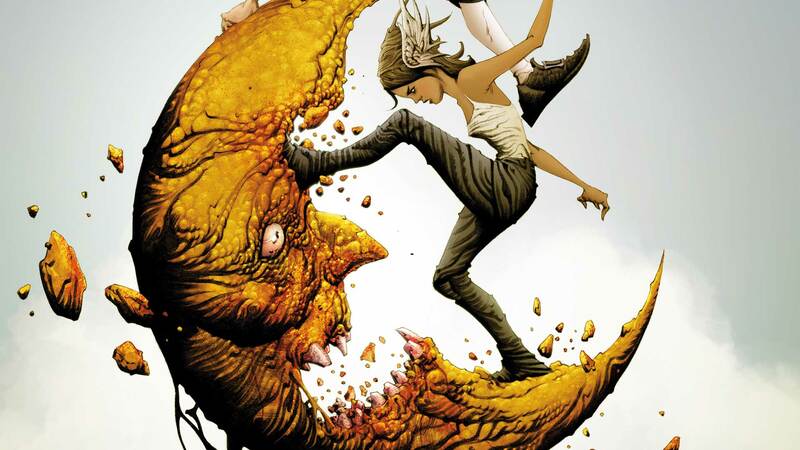 In The Sandman Universe, her monstrous side emerges as she tries to protect a dreamer from Matt. Likewise, it’s her angelic side—and she does look something like an angel with those wings on her head—that’s present when she’s stealing from dreams so that she can wheel and deal with her demon lover. In Dora, the monster isn’t always what’s bad and the angel isn’t always what’s good. Rather, both sides have the capability to be both. It’s a far more nuanced approach to this sort of symbolism than we often see in works of fantasy, and it’s one of the reasons why Gaiman’s universe, as well as Spurrier and Evely’s extension of it, are so interesting. After all, we don’t dream in black and white. THE DREAMING #1 by Simon Spurrier, Bilquis Evely and Mat Lopes is now available in print and as a digital download.